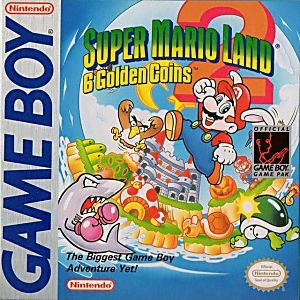 Super Mario Land 2 II 6 Golden Coins Game Boy Game Cartridge Cleaned, Tested, and Guaranteed to Work! This game is quite charming. I, personally, find it to be one of the best games on the system for it's simple fun. A must-buy for any Gameboy owners. Cheers! On elf the BEST handheld Mario titles, great graphics for the Gameboy, awesome sprites, and the first appearance of Wario! Definitely buy this title. Lukie has an amazing 90 day return policy, you can't go wrong! Spend over $25 and get free shipping every time! Lukie Rules!!! 90% of the game is simple and fun, but Warios castle is one of the hardest levels I’ve played in any Mario game ever. Just a heads up. This game is alot of fun with just the right amount of challenge. So entertaining to play and very fun to be up against wario. A great idea. All of the stages are very different and off a variety of gameplay. You can go wrong with this game if you are looking for a simple, yet fun platformer. mario is back but this time it's Wario up to no good and there is now save states and no princess. The game came in good condition. It works well with no problems (so far). I don't usually write reviews, but in this case I just had to. First of all the cart looked brand new, with no marks, scratches or dirt at all. Second, the customer service is the best I've experienced in a long time! I will definitely keep buying from Lukie games in the future! As for the game itself, it's Mario! A very strange Mario game, but the controls and graphics are closer to what you're used to on the NES, compared to the first Super Mario Land. It always felt a bit off to me, but it's also one of the best Game Boy game I've played, next to Link's Awakening.. Came in great condition and was able to play on SNES (Super GB). Can't complain! It's just not as fun as I remember it being [as a kid] - so it only gets 4 stars. Still, worth it. I love this game, like all the Mario games. And it works with the Super Game Boy, so it's lots of fun to play on TV, too. The game arrived in great condition, on time, and works fine. Thank you Lukie games. The cartridge was a little off color. But it was very clean , works great and the label looked perfect . I would order from lukiegames again for sure . I remember playing this game at a cousin's house and thereafter seriously wanting it. I remember seeing the comercials for it on TV and nearly being driven crazy by them. Tis is, as its name implies, the sequel to Super Mario Land. Mario's mission to defeat Tatanga was a success, but he returned home only to discover that Mario Land had been taken over by Wario, his evil twin, who was now holed up inside a castle sealed by a magical lock. THe only way to break the seal is to retrieve six golden coins, each of which is hiddenin one of the six subregions of Mario Land. Tis mission will not be easy, since Wario has hoards of minions all bent on insuring that he remains safe inside is fortress. Gameplay wise it's muc more like te main Mario franchise. You collect various powerups (including a new item similar to Raccoon Mario from Super Mario Bros. III. In this case it's Bunny Mario, but like Raccoon Mario you can fly in this form. Musically the game is similar to Super Mario World in that most of the tracks are variations of the same basic theme. The sound effects, unlike the first game, are much closer to the main series. All in all this is another game that any Game Boy owner should own or at least try. I really love this game. I used to play it a lot back when I was younger. It is still a great game, and is one of my favorite mario games! My game arrived in %100 working condition. Well worth the money!